Marcus Mariota took off for an 87-yard touchdown run in Sunday's game against Jacksonville. Entering Week 13, Tennessee Titans rookie quarterback Marcus Mariota had yet to fully display the running skills that helped win him the Heisman Trophy last season at the University of Oregon. That changed in a big way during the fourth quarter of Sunday’s game against the Jacksonville Jaguars. With the Titans trailing 32-28 and facing a third-and-7 on their own 13 yard-line, Mariota showed off his speed. The No. 2 overall pick in the 2015 draft dropped back before taking off for an 87-yard touchdown run. Per the Titans, Mariota’s touchdown was the third-longest run by a quarterback since 1960. 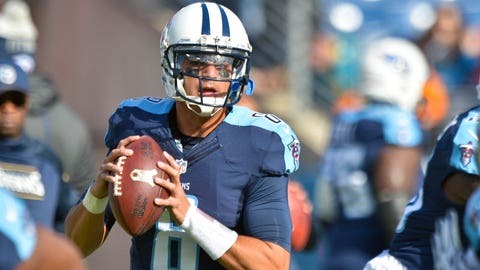 Mariota entered Week 13 with 137 rushing yards and one touchdown in nine games this season.